What is the SQRT Function? The SQRT Function is a Math and Trigonometry functionFunctionsList of the most important Excel functions for financial analysts. This cheat sheet covers 100s of functions that are critical to know as an Excel analyst. It will provide the square root of a positive number. The function was introduced in MS Excel 2010. Number (required argument) – It is the number for which we wish to find out the square root. It must be a positive number, an Excel formula, or a function that results in a positive number. 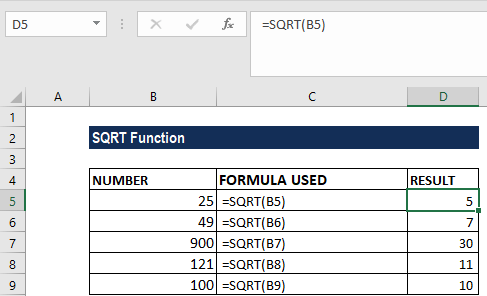 How to use the SQRT Function in Excel? If a number provided by a user is negative, the SQRT function will return the #NUM! error. The square root of a negative number does not exist among the set of real numbers. It is because there is no way to square a number and get a negative result. #NUM! error – Occurs when the supplied number argument is negative. The SQRT function, depending on the user’s requirement, can be used along with the ABS, ROUND, ROUNDUP, and ROUNDDOWN functions. SQRT is similar to the POWER function. However, the POWER function works like an exponent in a standard math equation. For example, for the number 25, we will provide the formula =SQRT(25) and =POWER( 25, 1/2).